P.S. Francesca's Collections is offering all Skunkboy Creatures readers 30% off a single regular priced item (online only). You can use the code KATIES until 11/30/11. Love everything about this! Those shoes and tights are so perfect together and that little bag is just gorgeous! OMG that outfit is GORGEOUS!! This outfit reminds me of valentines day and that makes me so happy! You put together the most amazing combos! Cute outfit!! Awesome vintage shawl :) nothing wrong with granny-chic - my favourite is oversized cardies - so warm and comfortable!! I loooove the granny style!!! As part of the mori girl subculture I am lucky enough to wear it more often. The funny thing is that I get more compliments wearing this style than any other. You look soooo cute!!! That looks so cozy! I would love one of those shawls for winter mornings. So cute! i almost bought those shoes... are they comfortable?? love the whole outfit!! as always. so cute! i think i need a shawl like that! You look amazing! The shawl looks so cozy and I love your tights! 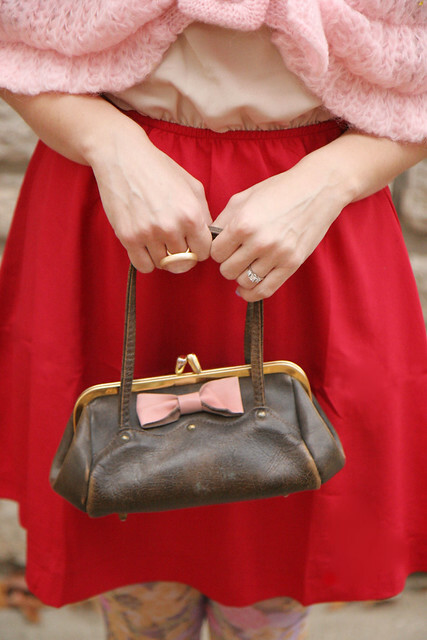 That sweet purse with the lovely bow? Totally just made my day. It's super awesome to see someone enjoy their clothing so much. Keep it up! I love the colour of your hair and you look uber cute! 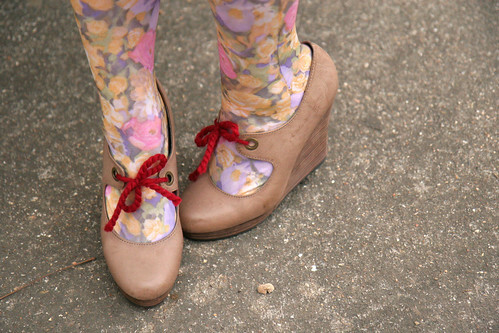 I love the big buckle on the shawl and the cute red laces on the shoes! Adorable Granny if you ask me! i see no granny nor toddler here. only a woman who has mad creative style, where she mixes unexpected elements of textures & color, that create an outfit masterpiece of inspiration! I so want to knit that wrap! The promo code you gave isn't working... any ideas?? I'll check into the code! love love love that shawl! eee! and this entire look, actually. thanks for the inspiration! that shaw is amazing. the clasp really makes it! My mother likes to make fun of my for my metal frame grandma sunglasses! So adorable! I have a tendency to go for kid-in-a-dressing-up-shop-style. I like the granny twist, tehe :P.
Oh, my! That shawl is pure perfection! And you rock it like no one else could ;). and your tights rock my socks off! I'm always being called a grandma! Grandma's rock. :] Love this outfit, Katie!! It's okay; most of the clothes I'm drawn to are either grannyish or toddlerish, too. :) Pretty outfit! That shawl is awesomesauce. I'm in love! Granny-licious! Lol. Love the outfit, especially those shoes. Great outfit. Great colors. Beautiful shawl. I love how you put it all together. awwhh I love this! The colors are so beautiful! You certainly make "granny" look very chic!! Loving those tights. And your shoes! Uhm, and then something completly different. I'm about to buy my first blythe and I feel mighty confused! I would love if you did a how to post! how to fin clothes, how to change the hair/wig ect. Do you watch Glee? "Somehow Rachel manages to dress like a toddler and a grandma at the same time." I love the shoes and tights! I think this is my favorite of your outfit posts! !